Chylothorax is a rare complication from a Lap Nissen Fundoplication for treatment of GERD. Two weeks post-op, the patient returned for follow up and was found to have a pleural effusion. Further evaluation, including thoracentesis revealed a chylothorax. The patient was given a trial of conservative management but ultimately required a thoracotomy for mass ligation of the thoracic duct and then lymphoscintigraphy with embolization of the chyle leakage. In the presentation of a chylothorax after a Lap Nissen Fundoplication, surgical drainage is required. Though conservative measures can be successful in the treatment of come chylothoracies, it may become necessary to perform a thoracotomy to surgically ligate the damaged lymphatic channels. 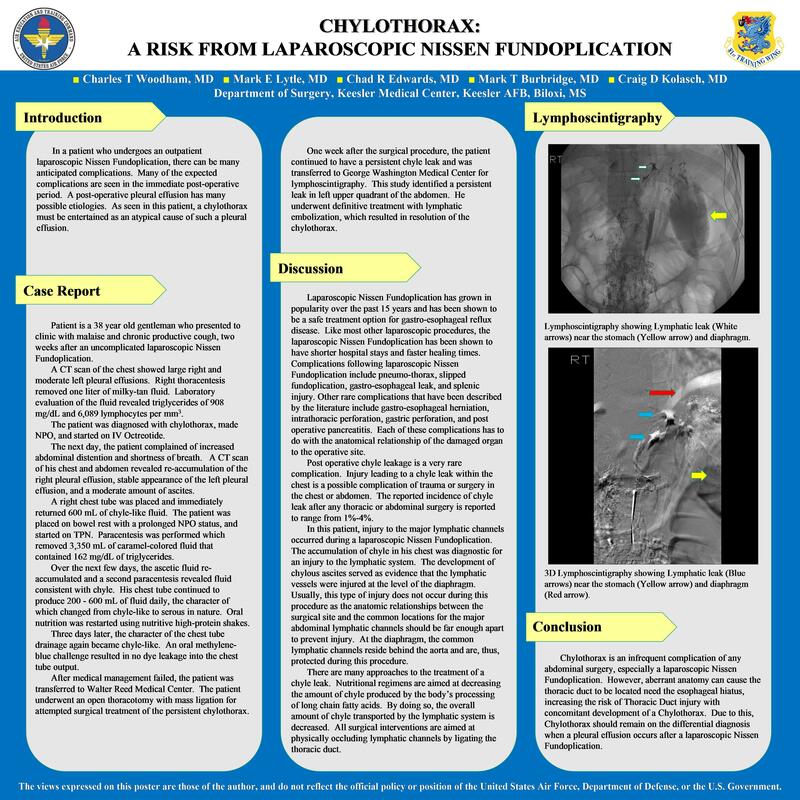 Imaging and interventional radiology may be necessary to obtain cure in a patient with a persistent leakage of chyle even after a surgical intervention. It is important to recognize that, though rare, a Lap Nissen Fundoplication can be the cause of a significant injury to the lymphatic channels leading to the development of a chylothorax.